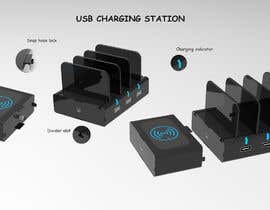 There are many different types of USB charging station. You may find them in [login to view URL] with the keyword “charging station”. Normally they are providing four to ten USB port, with or without wireless charger. 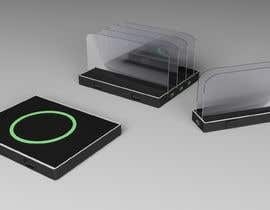 Now we need an attachable one consisting of 3-port USB module and wireless charger module. It means different modules attach or combine together to become an integrated one. The end customers could buy one or more modules depending on their needs, then they attach modules together by themselves. 1, Modules are attachable. A simple and solid fixing mechanical construction is necessary. 2, The dividers should be adjustable. It is aim to fasten different sizes of smart phones, tablets, etc. The ID is better to be an Apple style. The attached photo presents a rough design only for your reference. Pay attention to the yellow highlighted area. It is about the key features. Pls focus on the key features to save your time. Do not hesitate to share your creations. We are also looking for talent designer for future projects. Thanks. 1, Our rough design (prototype) in the picture just show you the concept (two features). It is for reference, actually we are not satisfied with it. 2, The project is mainly to realize a mechanical structure. 2, Pls help consider that the design will come to a real product, is it flexible, easy to use, good looking, as a customer will you like it? And it will be manufactured. The plastic parts should be easily molded. 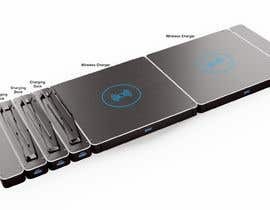 3, Separate modules wireless charger and 3-port USB charger should be designed. And end customers may buy one, two or more modules (3-port USB charger or wireless charger) depending on their needs and combine these modules together. The designer should know modules can be combined randomly. A final drawing should show the result. To save your time, focus on the concept design first. Very thanks! Key features: 1, Modules are not touching together, they should be combined solidly and they will not separate. As mentioned before, a simple and solid fixing mechanical construction is necessary. It is like child's toy brick. Pls combine three 3-port USB charger, two wireless charger together, then you will know what we need. 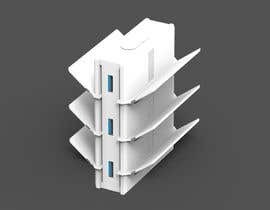 2, The dividers should be adjustable, it could be innovative, simple, and flexible. Could you clarify what you mean by "Pls combine three 3-port USB charger, two wireless charger together..." please? HI, Fred, Thanks for your interesting. I mean end customers may buy one, two or more modules(3-port USB charger, wireless charger) depending on their needs and combine these modules together. The designer should know modules can be combined randomly. A final drawing should show the result. The budget increased to find a good design.Thanks. Really this is already increased?? So I have to show you a winning concept idea for just 200usd? Thanks for your information. We may cooperate in future. It is more about concept design. You may focus on key features.Thanks. To save the time, no need pay more attention to logo, inside construction, color, finish, etc. Just focus on the key features.